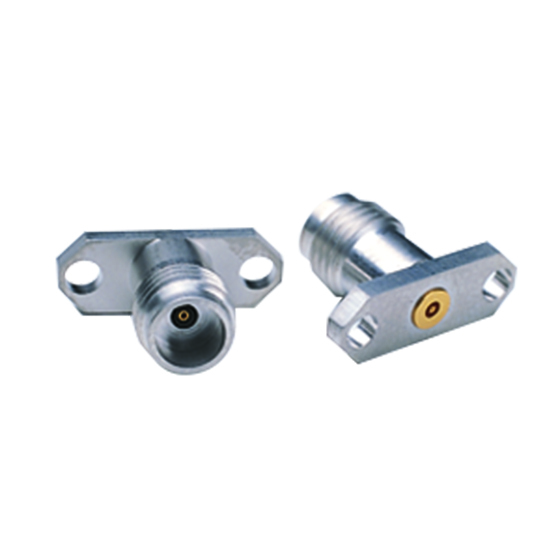 The V103F-012 is identical to V103F, however, this connector can be used with a 0.30 mm glass bead pin. Anritsu has the V110-1 Stress Relief Contacts ("Sliding Contacts"), available to provide protection to the connection in the event of temperature changes, shock, or vibration. It is used for microstrip and Coplanar waveguide with 0.15 mm trace widths. When used with Coplanar Waveguide, some engineers use a pin-overlap design, which allows the pin to be soldered directly to the trace. Ribbon bonding can be used to connect the pin to the trace. The pin can be attached to the trace using silver epoxy. Useful tools are available from Anritsu to help you manually install the bead. Use the 01-306 soldering fixture to properly position the bead in a housing before soldering. Use the 01-304 Drill & Tap Set to simplify the job of drilling the required concentric holes in the housing. It is used when NOT using Stress Relief Contacts. Use the 01-308 Drill & Tap Set for the same purpose when you use Stress Relief Contacts. The flange is secured to the housing, using either 2.2 mm screws or 2-56 screws.